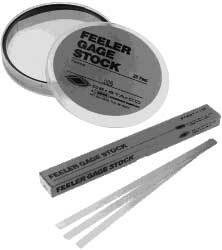 Feeler gage stock is packaged in convenient coils with dispenser clip for safety and utility. Coils are 1/2 x 25' with edges rounded and honed, and the gage thickness is etched every 12. Made from the highest quality 1095 tempered spring steel. Special lengths are available on order. Available in .001, .0015, .002, and every thousandth through .034. Strips are packaged twelve 1/2 x 12 strips to a box. FGA-small assortment containing 12 pieces. FGL-large assortment containing 19 pieces. Both come in a plastic sleeve dispensing package. Clearly marked for you convenience.